This page has developed from being asked to lead a house-group study on this prayer from a not very good study booklet. I realised that, after fifty years as a Christian, the prayer did not really mean much to me. I am deeply indebted to Keith Johnson and Nehemia Gordon for their book, "A Prayer to Our Father." With insight from the Jewish background of the prayer that Jesus, gave his followers as a pattern, and from the recently unearthed Hebrew manuscript of Matthew's Gospel containing this prayer, it has been possible to gain deeper understanding. I have no wish to upset anybody's Christian faith but hope you may gain a deeper understanding of this prayer and our communication with God. I hope you will consider these thoughts and then forget any that do not seem right. Matthew 6:6 "But you, when you pray, go into your room, close the door, and pray to your Father in secret. Your Father, who sees what is done in secret, will reward you." "And when you pray, don't babble on and on like the pagans, who think God will hear them better if they talk a lot. You, therefore, pray like this . . . .
compare this with various translations. The first thing you might notice is that the Kingdom, power and glory at the end has gone - because it is not in the earliest manuscripts. So however worthy the words, they were not Jesus' words but a later addition - something forbidden in scripture. But fear not, because we will find the acknowledgment of these attributes of our father will emerge from Jesus' words. First words, "Our Father" - the Hebrew word is Avienu, which is Avi, meaning father, with the suffix "oo" making it "our" father. So who is this plural us? It's not just the church. Jesus taught this to his Jewish disciples, as he introduced them to the fulness of their Jewish, Torah faith. So the people to whom God is Father are the Jews who believed in him. But, praise God, we Gentiles were brought into this family - grafted in like wild olive shoots into God's cultivated Olive Tree. (Romans 11) But it does not include those who have not accepted the Kingdom that Jesus brought. It is interesting that Jesus is teaching about how we pray to our Father by ourselves (See context above) but he wants our perspective to be of "Us." Here we have the massive paradox - we are addressing the one who created and sustains the universe as our Father. What an awesome privilege, and challenge. Hallowed is not a word in common usage today. Do we just guess at what it means to hallow something? Yitkadeesh comes from the same root as kadosh - holy and kidoosh - as in sanctifying the cup of wine in the Passover seder by blessing God who gave it. Presumably the prefix concerns the process. Sheemcha is from Shem, meaning name, and the "cha" suffix means "your" - Father's name. We know that, in Biblical thought, God's name is much more that the word we use to identify him -- it implies or conveys all his attributes and authority. Johnson and Gordon translate this line as, "May your name be sanctified." meaning that we wish our lives to cause holiness to be attributed to God's name - in the sight of the world "
However, in the context of what follows there may be a another, different way of understanding this line - keep your thumb in the place. Does God really need us to ask him to do this? What do we mean by God's kingdom coming? Had God lost his kingship over the world so that we need to seek its restoration? - Like when King David was ousted by Absalom? Can we expect God's will to be done by the governments of the world (Before Jesus returns and takes over all rule and authority? But the Hebrew Matthew is quite different. The Hebrew version of the Avinu Prayer speaks of God's kingdom being blessed; not coming. The phrase "may your kingdom be blessed" reflects an entirely different concept of the kingdom than that contained in the phrase "thy kingdom come." The Hebrew is not speaking about a future end-times kingdom but a present-day kingdom, one in the here-and-now. The Hebrew is saying: O, Father, may your present-day kingdom be blessed! But to take this a step further, is this not so much asking that the Kingdom be blessed, but blessing God for his Kingdom? The traditional "Lord's Prayer" written in the language of past centuries, uses the word "be" concerning God's will and God's name and tends to be read as a wish for the future. However, in other writings from earlier centuries (such as The Coming Prince by Sir Robert Anderson) "be is clearly used in a sense we understand as "is" or "are." Does this difference - from "thy Kingdom come" to "Blessed be/is your kingdom" adjust the emphasis of the whole beginning of the prayer? Is the prayer now no longer a list of requests headed with the address line to "our father in heaven?" Does the prayer now open with a section of worship and acknowledgment that allows us to get ourselves properly oriented towards God, after which we can raise our essential needs with this great, heavenly father. Try this version of the first four lines as one section. So, having prayed like this, can we doubt that our Father is able to do what we are about to ask him. And, remember, Jesus said that we should ask - believing that we receive what we ask. Remember that Jesus introduced this prayer by reminding us that, " your Father knows what you need before you ask him." Can we move on to the remainder of the prayer with a big "Therefore" in our minds? I am very grateful to Nehemia Gordon for taking the time to check out this idea, to see that I am not launching a new heresy. Nehemia Gordon points out how, at the time Jesus taught this prayer, and until relatively recently in the developed world, bread or equivalent food could not be taken for granted. Famines and disasters could deprive people of their daily sustenance quite suddenly. The member of the Father's kingdom needed to trust him for this essential provision. We may not feel this close to starvation, although disasters can befall us. Bread also has implications of other necessities of life, including spiritual nourishment, the word of God, and of course Jesus himself. We need to live our lives in daily awareness of our dependence on God for our basic needs. Trespasses ? What does that mean ? Surely not just entering a field belonging to somebody else. CJBÂ Forgive us what we have done wrong, as we too have forgiven those who have wronged us. KJVÂ And forgive us our debts, as we forgive our debtors. Nehemia Gordon translates Hebrew Matthew as "forgive us the debt of our sins,"
Yes, we are talking about debts of SIN. Firstly, forgive - What does that mean ? Forgiving those who ask for forgiveness is a central part of my Jewish heritage. In the Hebrew Bible, our heavenly Father is called El Nose, a "Forgiving God." The Torah teaches us to "to walk in all his ways," which means to be merciful and forgiving to our fellow human beings just as God is merciful and forgiving to us. While we are taught to emulate God's benevolent traits, vengeance is deemed to be an exclusively divine privilege. In Deuteronomy, the Almighty proclaims: "Vengeance and retribution belong to me," and the Torah explicitly forbids the individual from exacting vengeance. Are we contradicting our Gospel message, by saying God will not forgive us if...... ? When a person has deeply hurt us or even physically harmed us, it is very difficult for us to let go of our anger. But Leviticus teaches us:. You must not take revenge and you must not bear a grudge, but you must love your neighbour as you love yourself, I am Yehovah. The reason we must obey this commandment is simply because "I am Yehovah;" if we bear a grudge or hate our brothers in our hearts then we have sinned against our heavenly Father. The requirement to forgive those who have wronged us also follows from the Hebrew principle of midah ke-neged midah, or "reciprocal justice." According to this principle, God treats us the way that we treat others. Looked at another way - Yes, God forgives our sins when we confess them, but when we disobey his command to forgive, we are committing another sin that needs to be repented of and forgiven. Matthew 18:21Â Â Then Kefa came up and said to him, "Rabbi, how often can my brother sin against me and I have to forgive him? As many as seven times?" "No, not seven times," answered Yeshua, "but seventy times seven! Forgiving people who have not asked us to forgive them ? Luke 17:3Â Â Watch yourselves! If your brother sins, rebuke him; and if he repents, forgive him. Â Also, if seven times in one day he sins against you, and seven times he comes to you and says, 'I repent,' you are to forgive him." Is there a conflict here? I believe not; from the point of view of the brother, he should repent and seek forgiveness. But even if he does not, we should forgive and not hold a grudge. But someone who is not a believer who has wronged us? I suggest we need to forgive in our hearts; for our own wellbeing. What about Jesus' prayer of forgiveness for those responsible for crucifying him ? Yes, it shows his supreme love and grace, but why / how, if they had no remorse about it. Were they eternally forgiven - no matter what? Where is God's justice in that? I would suggest the clue is in Jesus' words, "for they don't know what they are doing." So they were forgiven, but they would later have to confront the knowledge of what they had done, when Peter and the others preached the Gospel. Then they had to repent and be forgiven or be condemned for rejecting Jesus the Messiah. Just like we all have to. Jesus was not going to condemn the people he had come to save - he entrusted vengance or forgiveness to his Father - as we must. Those who read this section of the Avinu Prayer in Greek (or in an English translation of the Greek) cannot help but notice a major discrepancy between the wordings in Luke and Matthew. In Luke, the prayer says "forgive us our sins," but in Greek Matthew, it says "forgive us our debts." The reader of these two Greek Gospels can only wonder whether Yeshua really spoke about "sins" or "debts." The answer to this question lies in the Hebrew source behind the Greek. The problem that faced the Greek translators of the prayer was that the Hebrew word for "forgiveness" - mechol - literally means "to cancel a debt." In Greek it sounds strange to ask God to forgive a "debt," because this is a term associated with banking and finance. It would be like someone in modern English praying to God: Oh Father, forgive me my mortgage! Jesus used the word mechol, which means to cancel a debt. When God forgives us, the debt of our sin no longer needs to be paid. It means we no longer have to carry around that burden of debt for our sin. Another Hebrew word for forgiveness is nasa, which means "to bear a burden." God is called El Nose "a forgiving God," or literally, "a God who bears [the burden of sin]." 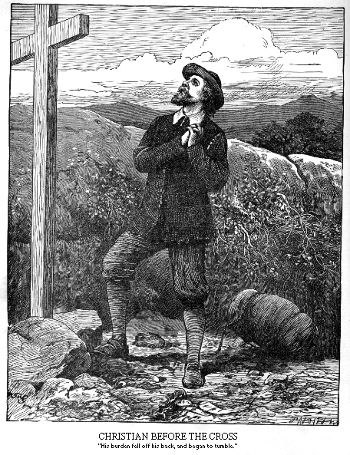 Picture of Christian, in Pilgrim's Progress, losing his burden at the cross. Frederic Barnard, engraved by Dalziel Brothers, in "Bunyan's Pilgrim's Progress with over 100 illustrations." Remember, as we pray to Our Father, we are still praying corporately. Yeshua could have opened his prayer with the words "my Father" and asked God to "forgive me for the debt of my sins." Instead, the entire prayer uses the plural, referring to "our" and "us." In Hebrew thought, a person bears both an individual responsibility for his own actions and a collective responsibility for the society in which he lives. While most English versions of the Avinu Prayer speak about "temptation," the Hebrew version speaks about a "test." The English reference to "temptation" is itself based on a particular interpretation of the prayer's Greek text. However, the Greek uses an ambiguous word that can be translated as either "temptation" or "test," depending on the context. In the New Testament the word in question usually means "test," as in the verse: The Pharisees and Sadducees came, and to test Jesus they asked him to show them a sign from heaven. Obviously the Pharisees and Sadducees were not trying to tempt Yeshua, they were trying to test him. While temptation and test have some overlap in meaning, they are not semantically identical. A temptation can be a test, but not every test is a temptation. The Hebrew version of the prayer shows that the Hebrew behind the Greek is "test," not "temptation," and therefore the Greek should be translated: "lead us not into a test." the Word Biblical Commentary explains that the Avinu Prayer must be speaking about a "test" because otherwise it would contradict another New Testament passage that says God does not "tempt" human beings. Temptations come not from God but from our human nature. One example of a test that has nothing to do with temptation is the biblical commandment not to test God. The Book of Deuteronomy says: Do not test Yehovah your God as you tested him at Masah. One of the interesting things about the words "do not bring us into the hands of a test" is their strong connection to ancient Jewish sources. In fact, these exact words appear in the Talmud, the teachings of the ancient Rabbis, which records the following prayer: Do not bring me into the hands of sin, or into the hands of a test, or into the hands of shame. This rabbinical prayer is virtually identical to what we find in the Hebrew version of the Avinu Prayer. The concept of asking God not to test us clearly has a place in ancient Jewish sources. This concept first appears in the thirtieth chapter of the Book of Proverbs, which records the prayer of a little-known Israelite sage, Agur bin Yakeh: Two things I ask from you, do not deny me them before I die. Distance from me lies and falsehood;. do not make me rich or poor, but give me my allotted bread. Lest I be satisfied and deny saying, "Who is Yehovah?" and lest I become poor and steal and swear [falsely] in the name of my God. When God tests us he is challenging us to show our true love for him by remaining faithful to him, even through difficult times and despite situations that tempt us to sin. Another person tested in the Hebrew Bible was Abraham. One of the most difficult tests God presents us is the test of the false prophet. We are warned about this test in the 13th chapter of Deuteronomy: When a prophet or a dreamer of dreams arises among you and gives you a sign or a miracle, and that sign or miracle which he told you comes to pass, saying, "Let us go after other gods (which you have not known) and let us worship them." You must not listen to that prophet or that dreamer of dreams, because Yehovah your God is testing you to know if you really love Yehovah your God with all your heart and with all your soul. Yeshua himself faced such a test at the hands of Satan. As mentioned above, most translations describe this as a "temptation," but the same Greek word for "test" used in the prayer, appears in this context as well. It is also clear from the description of the incident in the first three Gospels that Yeshua was tested, rather than tempted. When Yeshua was teaching the Jewish multitudes how to pray, the idea of a divine test was not just an abstract theological concept but an earthly reality he had experienced firsthand. Yeshua must have turned his eyes towards heaven and prayed in his heart: O heavenly Father, I have been through a test myself and I know how difficult it is! Please have mercy on your children and do not bring them into the hands of a test! When God tests us we do not always realise that we are in the midst of a test. we should rejoice in knowing that we are being shaped and moulded by our heavenly Father, who is a righteous judge with a master plan. The study booklet, working on "Lead us not into temptation", seemed to go into much less profound discussion of avoiding temptation - sort of Do It Yourself godliness. The Greek version literally says "deliver us from the evil," but the numerous translations based on the Greek did not agree about the meaning of the last two words. Some interpreted them as referring to the abstract concept of "evil," while others personified these words as Satan in his guise as "the Evil One." The Greek is ambiguous and can legitimately be translated either way. Needless to say, there is a big difference between asking God to protect us from the evil which may befall us in the course of our lives and asking him to protect us from the Evil One. While the Greek is ambiguous, the Hebrew is not. The Hebrew version reads "protect us from all evil," which echoes the words of the psalmist: "May Yehovah protect you from all evil." Because the Hebrew speaks about "all evil," it is clear that it is not just referring to a personified Satan but to all forms of evil. Ever since Adam and Eve ate from the Tree of Knowledge of Good and Evil, humans have wondered about evil's origin. As people suffered from wars, plagues, and famine, they struggled with the question of how a good God could have created a universe filled with evil. The ancient Persians found a solution to this problem in the religion of Zoroastrianism, which taught that there were really two gods in the universe who are diametrically opposed to one another: The Zoroastrians believed that all good in the world emanated from Ahura Mazda whereas all the evil emanated from Angra Mainyu. These two gods were believed to be archenemies, and each led a large host of angels perpetually engaged in spiritual warfare against one another. The Zoroastrians looked forward to the final showdown between the two gods, in which Ahura Mazda would emerge victorious, ushering in a millennial age of peace and tranquility. "I am Yehovah and there is no other; I form light and create darkness, make peace and create evil; I Yehovah do all these things." Yehovah told Cyrus there is no other god besides him and he is the creator of evil, just as he is the creator of good. Some Christians prefer not to blame God, and they certainly do not want to blame themselves, so they shift all the blame to Satan. The image in the minds of many people is of Satan as an out-of-control teenager and God as an overwhelmed parent, unwilling or unable to rein him in. Blaming someone else for the evil that we do is as old as the first human sin in the Garden of Eden. When Eve defied God's explicit commandment not to eat of the Tree of Knowledge of Good and Evil, she tried to blame it all on the serpent. While God creates all things, including evil, he gives us the freedom to choose whether we do good or evil. A central concept in both the Hebrew Bible and the New Testament is that we are responsible for our own actions, and cannot blame anyone else for the evil that we do. God explains this in the Book of Deuteronomy: Behold, I place before you today life and good and evil ...choose life so that you and your descendants may live! This concept also appears in the Epistle of James, which says: Each one is tempted when, by his own evil desire, he is dragged away and enticed. Then, after desire has conceived, it gives birth to sin. When Yeshua taught the Jewish multitudes to pray "protect us from all evil," he wanted them to focus on their heavenly Father and no one else. God is the only one who can protect from all evil. This includes the evil of Satan, the evil that lurks in the human heart, and the evil of natural consequence. The words "protect us from all evil" are so much more powerful than asking God to protect us from the Evil One. Our heavenly Father is the only one who can answer this prayer. He is the only one who is not limited by time or space, the only one not intimidated by evil spirits or angels, the only one not bound by heaven or earth, and the only one who controls both light and darkness. Very worthy words but not from Jesus, apparently. But when we have prayed the first few lines as worshipping our father in Heaven, we have covered the Kingdom, Power and Glory. Amen is a very good Hebrew word that everybody knows. It is an affirmation or a buying into what has just been prayed. Because it is our prayer to our father.